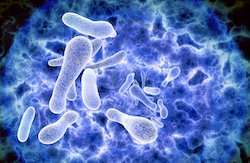 Between 5,000 and 8,000 cases of Legionella pneumonia – most known as Legionnaire's disease – are diagnosed each year in the European Union. There is no vaccine available and, in 12 percent of cases, extreme symptoms such as respiratory or multi-organ failure will result in the patient's death. "The main problem of quantitative polymerase chain reaction (qPCR) is that it enumerates DNA of both live and dead cells, leading to an overestimation of the actual health risk. Moreover, PCR inhibiting compounds in environmental samples may potentially lead to inaccurate target quantification or false-negative results," says Inma Solis, CEO of Spanish SME BIOTICA. BIOTICA aims to develop better, faster environmental testing alternatives to culture methods for the detection of microorganisms – notably to avoid inadequate or unnecessary disinfection treatments. Its flagship product, Legipid, is a novel environmental testing method based on immunomagnetic separation (IMS) by anti-Legionella immuno-modified magnetic beads. "It is generally recognised that the main analytical issue is to separate the target from the rest of the sample," Solis explains. "Magnetic immuno-beads provide such separation, and Legipid combines it with an enzyme-linked colorimetric detection for a rapid 1h test to determine Legionella sp. concentrations in water samples." The method is pretty straightforward: The original water sample is first concentrated by filtration or a similar method, before being eluted and dispensed into the test cuvette. A suspension of Legionella binding magnetic beads is then added, causing Legionella cells present in the sample to bind to antibodies immobilised onto the surface of the beads and form bacteria/bead complexes. These complexes are then incubated with an enzyme-conjugated anti-Legionella antibody and can be visualised by colorimetric reaction when enzyme substrates are added. In 2015, BIOTICA obtained funding under phase 1 of the SME instrument in 2015 to develop a completely automated device using IMS to provide onsite testing. The project recently completed its second phase. ULISENS includes an automated immunosensor with a filtering module and disposable reagents cartridges that allows for rapid determining of Legionella levels, while an optical reader provides easily accessible digital readouts of Legionella concentration measurements. According to Solis, results can be expected in two hours with no downstream workup. The performance of the ULISENS system is comparable to the reference Legipid method. "The ULISENS method is a more reliable option for routine testing, particularly in the analysis of water samples with high levels of contamination. Automatic Legionella detection eliminates human errors inherent in the manual methods. Besides, robotic assay handling reduces the variability of the results, removes the risks of miscounts, mid-test contamination and incorrect data entry, in turn leading to fewer inconclusive results and supporting timely steps. Timely steps ultimately mean more uptime, less delay and fewer re-tests," Solis enthuses. ULISENS is meant for Legionella control systems at potentially hazardous facilities. Customers include industry (mainly cooling towers manufacturers and energy intensive companies), building maintenance companies, risk facility owners and water testing laboratories. Commercialisation is expected soon, and BIOTICA is already planning to develop new versions for specific market niches. "By changing configuration to obtain portable and compact versions for swimming pools, we could open the door to an interesting market with a potential of 15 million units sold," Solis concludes.